On 15th May 1998, the Disasters Emergency Committee (DEC) launched the Sudan Crisis Appeal to raise money for the victims of a famine that was affecting the south of Sudan. The DEC, a collective of British broadcasters and British humanitarian organisations, focussed its appeal on the Bahr el Ghazal region and determined that the famine was threatening the lives hundreds of thousands of people, as a result of two years’ failed harvests. The appeal, like many before it, called for the British public to give monetary donations to pay for the delivery relief aid. 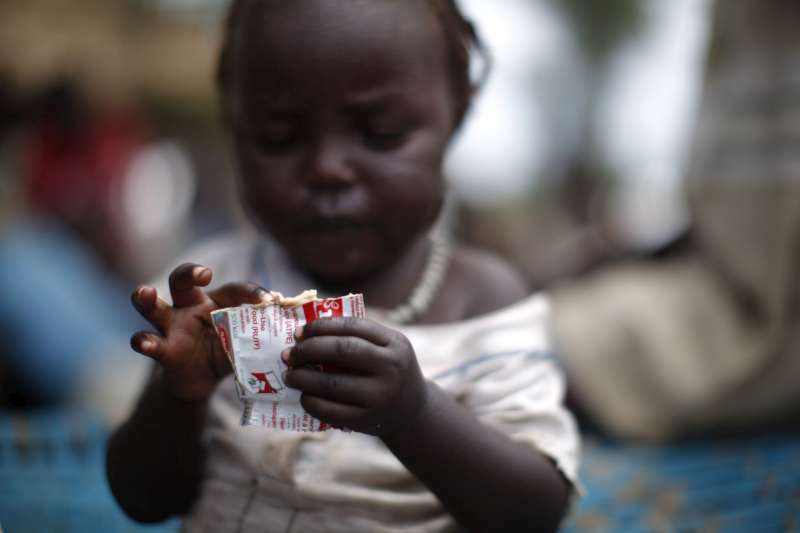 Within Sudan, British non-governmental organisations (NGOs), such as Save the Children UK and Oxfam, set up therapeutic feeding centres for children with acute malnutrition. Food aid was also delivered using air-drops to areas otherwise inaccessible due to poor infrastructure. Despite successfully raising £14 million, and straying little from previous famine responses, this response generated fierce debate, led by Clare Short, the General Secretary for the Department for International Development (DfID). These debates, which centred on the use of airdrops, demonstrate a reconceptualization within Britain, of the nature of famine itself. Britain’s relationship with famine has a long history. Histories tracing this relationship have drawn a thread from discussions of class and hunger within England in the 1840s (Vernon 2007), to investigations into the continued use of famine response methods devised in colonial India (De Waal 1989). It can be seen in the origin stories of British organisations such as Save the Children, which was created by members of the Fight the Famine Movement in 1919, in response to blockades in Berlin and Vienna. Similarly, Oxfam, originally the Oxford Committee for Famine Relief, celebrates its origins as a famine response to the Allied blockade of Greece in 1942. British centrality within early famine response is also reflected in the appointment of John Boyd Orr, the British Nutritionist, who became the first director of the UN’s Food and Agriculture Organisation in 1945. Yet there is also an argument that the influence of British NGOs and the British government in the shaping understandings of hunger became marginal after 1940, most prominently put forward by historian James Vernon, in his book Hunger: A Modern History. While scholars have emphasised new channels of public engagement after the end of empire (Bocking-Welch 2012) and the importance of NGOs in famine response (Kevin O’Sullivan 2014), the complex relationships between government, researchers, and relief organisations in the famine field has yet to be fully historicised. Through an investigation of the response to the famine within Sudan 1998, it is clear that the British government, and British NGOs, continued to play an influential role in the way that famine was perceived and the mechanisms of famine response after the 1940s. Crucially, following the creation of DfID in 1997, the British government revised its agenda for international aid. DfID’s first annual report stated that it aimed “to bring development considerations into the mainstream of government thinking” (DfID Annual Report, 1998-99: p.3). Clare Short, as DfID’s Secretary-General, presented this attempt to marry development thinking with famine response in her criticisms of the famine response in Sudan. She argued that British NGOs and the British Government should look beyond the short-term causes of the famine (the failed harvests) and towards the longer-term, socio-political, causes of the famine. By socio-political causes, Short was referring to the continuing civil war between the Government of Sudan (GOS) and the Sudan People’s Liberation Movement (SPLM). The instability and aid restrictions created through this civil war, in conjunction with the two years of failed harvests, resulted in the high levels of malnourishment and led to the declaration of a famine in June 1998. Speaking to the House of Commons, Short critiqued the humanitarian relief sent to Sudan, determining that the 90% of the budget spent on air-drops was an unjustifiable percentage. Rather, she argued that there should be more focus on engaging with the political dynamics within Sudan, which she saw to be a main cause of the famine. She believed that NGOs and the British Government should be working towards a negotiated and peaceful settlement between the GOS and the SPLM. Short’s criticisms did not go unheard. 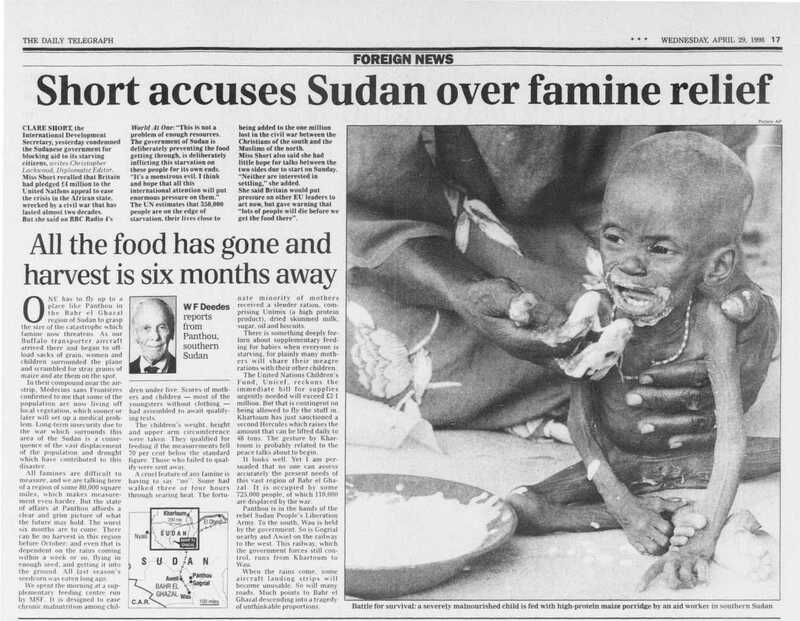 They were publicised throughout the British print media, and in October 1998, Oxfam, Save the Children UK and Médecins Sans Frontières, released a joint statement that recognised not only the political nature of the famine, but also the need for political accountability within Sudan. This statement, demonstrated a movement away from the traditional Malthusian understanding of famine, which stated that as a population grew, it would inevitably outgrow its food source. The Malthusian understanding required the delivery of food aid to counter this imbalance between population growth and food production. The work of economist Amartya Sen in the 1980s however, presented a more complex understanding of famine that investigated the social determinants, or ‘entitlements’ that restricted a populations access to food (Sen 1982). Recognising that famine had wider causes than merely an imbalance between population growth and resources, Sen’s work politicised the notion of famine. British experts in medical and nutritional aspects of famine response were also engaging more with development models in this period, responding to what they perceived as shortcomings in international relief practice. International humanitarian response to the Sudan famine came primarily in the form of Therapeutic Feeding Centres. These centres were set up in multiple locations across the region and were predominantly run by international NGOs. However, Medical doctor Steve Collins, who responded to the famine in Sudan, recognised multiple problems within this system. These centres relied heavily on international staff and were short-term in nature. To counter-act these challenges Collins, devised “community therapeutic care”, today called “community-based management of acute malnutrition” (CMAM). CMAM, based on development models, worked to bring the treatment directly to patients within the community and to build greater trust between community members and their local health staff. With the use of newly invented ready-to –use therapeutic food, such as Plumpy-nut, patients were given the facilities to treat their family members at home with the support of local health staff. DfID played a fundamental role in funding the first trial of the CMAM model in Bahr el Ghazal in 2003. The complex forces that influenced these changes in practice and implementation should not be oversimplified into a story only of British achievement or of a simple fix. Collins himself argued that CMAM was developed out of the need to access more communities and thus suggested that it was not directly a reaction to the Sudan relief effort. The integration of CMAM into famine response reflected the recognition of the long-term, complex nature of famine and thus the need for a long-term famine response. Though continuing to be used alongside CMAM programmes, the short term, labour-intensive therapeutic feeding centres were no longer deemed a satisfactory way to respond to the complex nature of famine. Nonetheless, the work of organisations and individuals based in Britain played an essential role in driving change. These examples demonstrate DfID’s attempt to engage with new practical methods of delivering aid based on development models with a longer-term focus. By the early 2000s, DfID, along with British NGOs, no longer perceived famine as an isolated food shortage problem that could be fixed by air-drops of food packages. Rather, it was understood as the outcome of longer-term socio-political challenges, in this case, the civil war. The changing understanding of famine and famine response had an impact internationally. In 2007, CMAM was officially recognised by the World Health Organisation and the World Food Programme as the paradigm of famine treatment. It is similarly offered as the preferred treatment for famine within the Sphere Handbook, which outlines the minimum standards of work for international humanitarian work. The 1998 Sudan famine reflects a movement within both the British government, and British NGOs, away from a humanitarian-based delivery of aid and towards a longer-term, development-centred approach to relief. The changes and debates surrounding famine response can be seen as emblematic of wider discussions that attempted to unpick the relationship between relief and development work, debates that remain vivid within the UK aid sector today. Deng, L. B. ‘Famine in the Sudan: Causes, Preparedness and Response: A political, social and Economic Analysis of the 1998 Bahr el Ghazal Famine’. IDS Discussion Paper 369 (1999): pp.1- 112. Rhodes, Tom. ‘Famine Politics and the Cycle of Relief Failure in Sudan’s civil war: A Case Study of the OLS Relief Operation in the Bahr-el Ghazal Famine, 1998’. Global Politics Network (2002), http://www. globalpolitics.net [27 October 2016]. Vernon, James. Hunger: A Modern History (Harvard: Harvard University, 2007). Bocking-Welch, Anna. ‘Imperial Legacies and Internationalist Discourses: British Involvement in the United Nations Freedom from Hunger Campaign, 1960–70’. The Journal of Imperial and Commonwealth History 40, no.5 (2012): pp. 879-896. O'Sullivan, Kevin. ‘Humanitarian encounters: Biafra, NGOs and imaginings of the Third World in Britain and Ireland, 1967–70’. Journal of Genocide Research 16, no. 2-3 (2014): pp.299-315. Jenny Chapman completed a BA (Hons) in Historical studies and Religious studies, and an MA in Humanitarianism and Conflict Response at the University of Manchester. She was awarded an ESRC- funded Case Studentship with the Humanitarian and Conflict Response Institute (HCRI) at the University of Manchester in 2015. Her PhD project investigates the British Medical Humanitarian sector between the years of 1988-2014 and is co-supervised by HCRI and the Humanitarian Affairs Team in Save the Children UK. Jenny was a participant of the Global Humanitarianism Research Academy 2017. Citation: Jennifer Chapman. ‘Sudan, 1998: A Change in British Famine Response’, in Online Atlas on the History of Humanitarianism and Human Rights, edited by Fabian Klose, Marc Palen, Johannes Paulmann, and Andrew Thompson, 2018-06, urn:nbn:de:0159-2018061906 [2019-04-24].